It was all worth it! The sleepless nights wondering whether my design would be picked, the ceaseless pestering of friends and family…. I won the Road CC x Trek Project One competition! Thanks so much to everyone that voted for my design! 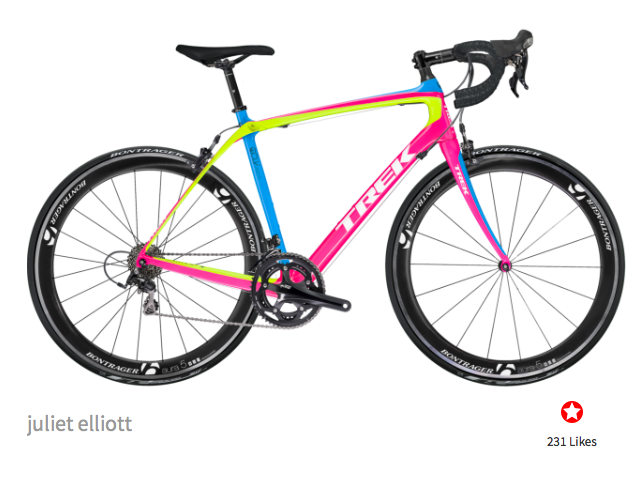 To recap on what the competition entailed – Entrants were asked to design their dream bike using Trek’s Project One bike builder, which could be anything using a variety of frames, wheels, components and colours. I decided to go for the most garish colour scheme I could think of, the reasoning being that I should take the opportunity to design something totally unique. I tinkered around with combinations until my bike came in under budget, which meant going for the cheapest bars and stem in order to save money for the wheel set. From a total of 6000 entries, Trek and Road CC picked 25 finalists whose designs were then put up for public vote. And thanks too everyone that voted, mine came out on top, which means I get to have my bike built! I’m so excited about riding this awesome looking machine; I’ve heard it’s at the painters as we speak, so fingers crossed I’ll be getting it soon. So just as soon as it’s here and I’ve recovered from a bout of some annoying and mysterious illness that’s stopped me riding since last week, I’ll be putting in a lot of miles on this machine, not least as I’m doing Ride Across Britain this year. Whoop!